The Relics of Sri Aurobindo reside in the Shrine Room, where we gather for meditation twice daily. Inaugurated on the 15th of August, 1983, the Relics radiate a force that is precious beyond calculation for many who visit our Center. Friends and aspirants are especially welcome to come for birthday meditations. The Center has a rich library with about 10,000 books on a variety of subjects, including yoga, science, history, religion, and the arts. They are freely available for personal and group study, provided that they be read and worked with on the Center’s premises. Among these books is a complete set of the original ARYA, which was published from 1914 to 1921. Within our library are a number of books signed by Sri Aurobindo or the Mother, including the first edition of The Life Divine, Hymns to the Mystic Fire, The Synthesis of Yoga, and Entretiens 1956. A first edition of The Mother from 1928 resides in our collection. The Center maintains an adjoining guest house, which houses about half of our library. The guest house is available for out-of-town aspirants who come to further their practice of the Integral Yoga or to sit in the peace of the Shrine Room. The Sri Aurobindo Ashram website offers visitors solid information about the Integral Yoga in a welcoming format. Available are biographical sketches of Sri Aurobindo and the Mother, a concise description of Sri Aurobindo’s teaching and method of practice, a description of the Ashram which grew up around the pioneers, and material relating to the Ashram’s Centre of Education. Those interested will also find the opportunity to view or download currently available PDFs from the Complete Works of Sri Aurobindo and the Collected Works of the Mother. There are many other resources available on the Ashram’s website, including music recorded by the Mother and Sunil, as well as downloadable Darshan messages and images. And there is a Publications page, through which one can order books and periodicals. Other multimedia resources connected to the Ashram are available. 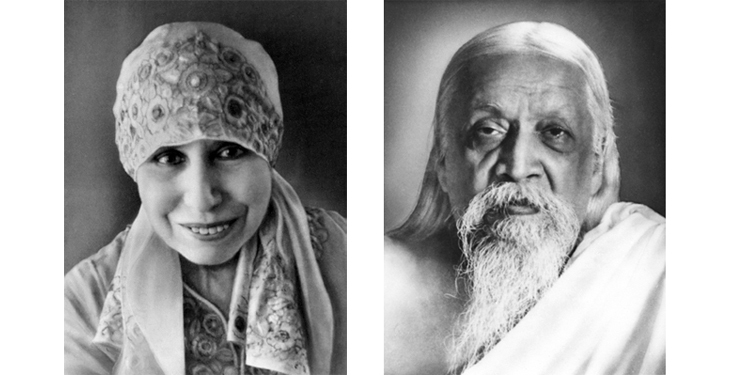 Another website dedicated to the Mother and Sri Aurobindo, rich in links and literature is Miraura. One of the loveliest periodicals produced in Pondicherry is the Golden Chain, the Alumni Journal of the Sri Aurobindo International Centre of Education. Many of its back issues are now available as PDFs.